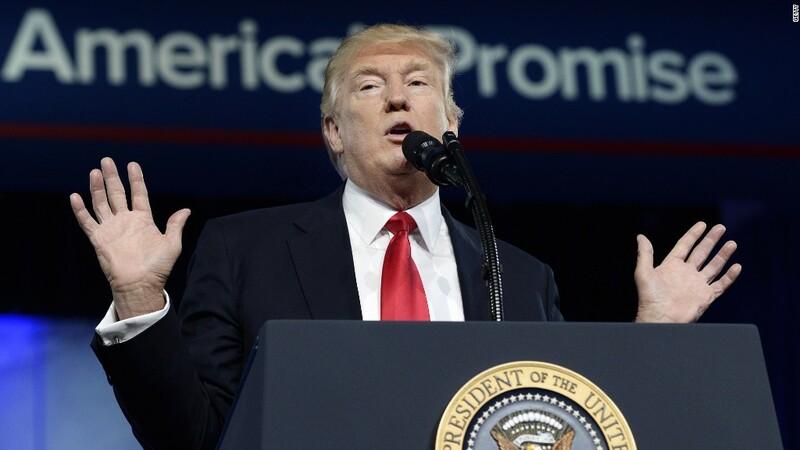 President Trump wants to jack up U.S. military spending. He's likely to find some support for that. The defense budget has been curbed in recent years and many lawmakers in both parties are concerned about the country's military readiness. But even with the cutbacks, the United States still spends far more on defense than any other country in the world -- in fact, more than many other countries combined. 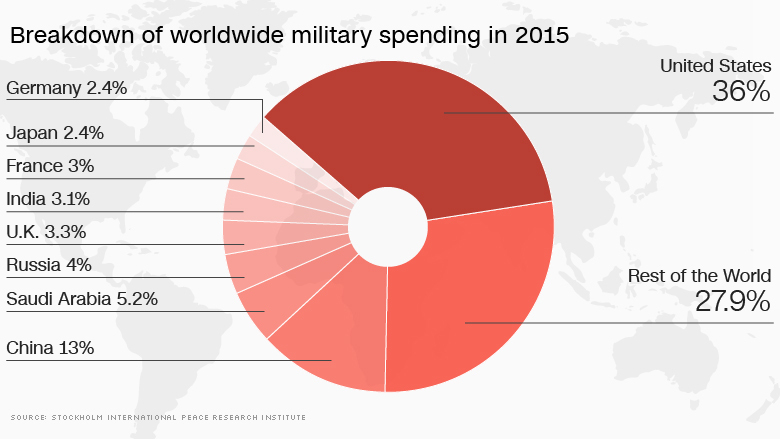 In 2015, the United States accounted for 36% of all military spending worldwide, according to the Stockholm International Peace Research Institute. Trump is now proposing to increase U.S. defense spending by $54 billion next year. That's a 10% increase over the cap on defense spending imposed by a budget deal that Congress passed six years ago. His proposal, if approved by lawmakers, would push the U.S. defense budget up to $603 billion next year. That amount, however, doesn't include any extra defense spending presidents ask for through supplemental requests during the year to cover overseas contingency operations, emergencies and disaster relief. Typically, that adds another $60 billion to $70 billion a year to federal outlays. So all told, if Congress approves the president's request along with his expected supplementals, defense could account for about 16% of what the Congressional Budget Office estimates will be a $4 trillion federal budget in 2018. At the same time, Trump will ask Congress to pay for his military spending increase by cutting $54 billion from other parts of the federal budget. That will be a tall order since the president has already ruled out making cuts to Social Security and Medicare, which account for more than 40% of annual spending. Consequently, many of the cuts would likely have to come from nondefense domestic programs. Those include everything from Head Start to food stamps to medical research and technology grants. Trump is also expected to propose changes that effectively would reduce federal spending on Medicaid. Some of the cuts could be severe in many programs, even though they, like defense, have been subject to cutbacks in recent years. To the extent any new cuts are made in programs that lay the groundwork for the future -- for example, in terms of innovation or education or energy conservation or foreign crisis prevention -- it's the equivalent of "eating your seed corn," said Steve Bell, a fellow at the Bipartisan Policy Center and a former Senate Budget Committee staff director under Republicans. The president's proposed defense spending increase is just part of his full 2018 budget proposal to Congress that won't be ready until May. At that point Congress will debate what parts should be adopted and what won't pass muster with a majority of lawmakers in the House or Senate. But one thing is a fair bet: There are likely to be plenty of fights along the way.